The Grow Media of choice. The Grow Bed Media in an Aquaponic System offers a method of naturally filtering the fish waste from the water and returning clean water back to the fish, while at the same time supplying the beneficial bacteria a place to break down harmful chemicals and convert them to necessary nutrients needed for plant growth. 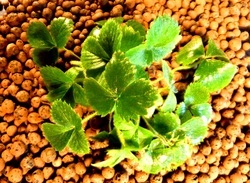 The Grow Bed Media of choice is Expanded Clay Pebbles otherwise known as Hydroton. It costs a bit more but it's clean, lightweight, reusable and easy on the hands because of the rounded edges. Pea gravel or small river rock is another good choice. Many people use it because it’s free or fairly inexpensive, and it works. The down side is that you have to clean it before you use it and it can be quite heavy so you'll have to keep that in mind if you plan on moving your system around. Less common is Lava Rock and Sand. Lava Rock has sharp corners making it hard on the hands and can potentially cut roots. Sand is also not as common because it tends to retain salt and doesn't work well with Gravity and Bell Siphons. Sand will not work in an AquaponicLIFE Urban System. At AquaponicLIFE we offer Hydroton (Expanded Clay) as a Grow Bed Media purchase option, but because of shipping costs it may be more practical for some people to buy Hydroton at their local Hydroponic or Gardening Store.